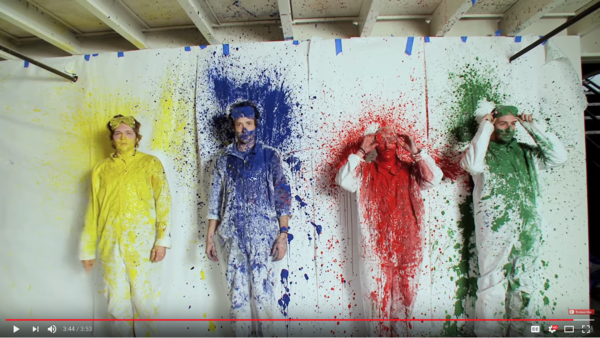 Teachers are using OK Go videos — like This Too Shall Pass — to teach students about science and math concepts. Sure, OK Go is a rock band. Their songs get on the radio, they've played sold-out shows, but the group is far better known for their really complex and elaborate videos. There's the one (viewed 41 million times) where they're all dancing on treadmills, jumping back and forth in time to the music. Another (12 million views) where the band is flying — and singing and dancing — in an anti-gravity plane; they open a box of balls and the little spheres just float through space, suspended in air. All those millions of viewers? It turns out many of them are teachers and their students. "I subliminally brainwashed my kids into being OK Go fans," jokes Jennie Magiera, who taught in Chicago's public schools for 10 years. "The music videos are viral, and you watch them and you're like, 'How did they do that?' "
And, as any teacher knows, when kids are curious, it makes them eager to learn. Magiera points to the video for "Here It Goes Again" — the one with the treadmills. It became a staple in her middle school math classes. "A treadmill is a great way to teach rate," she explains, "because if you're at 3.8 speed, that's a rate. If you're at 6.2 speed, that's a rate." The video introduces questions and concepts, like: "How many miles per hour is that? How fast are you going? How much harder is your heart beating?" The band — and its publicist — have been fielding requests for years from teachers who want use their videos in their classrooms. "I think every band is kind of surprised to find who their audience turns out to be," says Damian Kulash, OK Go's lead singer. "Definitely not how you start out a rock band, going, 'Let's teach!' "
And yet, backstage at concerts, he and the other band members are constantly meeting and hearing from these teacher fans, and their students. Kulash says he's met kindergarten teachers and college professors using the same videos, for very different ages. Teachers I talked with say they weave the band's videos into lessons about science, math and art — introducing concepts like gravity, transfer of motion, perspective, quadratic equations, parabolas and the importance of failure and persistence. And, says Janet Moore, it puts a cork in that perennial question math teachers get: When am I ever going to use this? Moore is a professor at the University of Illinois, and gets that question a lot. She teaches math for non-math majors. She also leads professional development workshops for other teachers, outlining how they, too, can use OK Go in their classrooms. The one that really gets them excited, she says, is the video set to the song "This Too Shall Pass." Any teacher watching this incredible 4-minute Rube Goldberg machine can find lessons in there. There are cascading dominos, rolling marbles building momentum, a tire flips electrical circuits, which turns on lamps, a guitar with spoons plays notes on water glasses, perfectly timed to the instrumental break. A piano smashes to the ground, a TV gets destroyed — and that destructive force eventually results in the band members getting splattered with paint. "It's a great introduction to energy concepts," says Moore. "It sparks inquiry, it sparks curiosity." As science standards shift away from "downloading information to students brains," she adds, towards understanding concepts, these videos can have lasting resonance with students. "Anyone can understand math and science concepts," she says, "and when you understand them, you can see the world around you differently." The band, lead singer Kulash admits, are "nerds themselves." And eventually, they saw a way to turn all this interest into an opportunity: "Is there some way that we can make that journey easier for them?" That question led the band to partner with the Playful Learning Lab at the University of St. Thomas in Minnesota. "Sometimes folks who don't have experience in education have a great idea, but it doesn't really translate to what it's like to be in a room with 27 8-year-olds," explains AnnMarie Thomas, the lab's founder and director. It was her team's job to merge the band enthusiasm with pedagogical, research-based ideas. "You're not gonna send your second-grade class up in zero-gravity, or put them in a stunt car to drive around making a giant instrument," Thomas explains. So the question becomes, "How can we take these messy, really expensive concepts and give an authentic engaging experience for kids?" She started by surveying more than 600 teachers. Educators told them they wanted three main things from such a collaboration: classroom materials, challenges and assignments, and access to the band. What they came up with? It's called OK Go Sandbox, a free website with educator guides that include material lists, assignments and suggested vocabulary words. There are videos that go behind the scenes with the band members to explain the concepts. One of them challenges students to use a compass on a smartphone to make music. The new resources are mapped to science standards, like the Next Generation Science Standards — a multi-state initiative — so teachers have an easier sell when adding it to their existing curriculum. "The universal thing we're trying to get at is just curiosity and wonder," says Damian Kulash. "That excitement about the world, where you want to uncover something magical." The band OK Go is known for their complex and elaborate music videos. OK GO: (Singing) It could be 10. But then again, I can't remember half an hour since a quarter to four. CHANG: Maybe you've seen that one where they're all dancing on treadmills, jumping back and forth in time to the music. It's been viewed at least 41 million times. This month, they're out with a new release. And what they've dropped is not a new album or a fresh music video. It's curriculum. Elissa Nadworny of the NPR Ed team explains. ELISSA NADWORNY, BYLINE: It turns out those videos are super popular in classrooms. DAMIAN KULASH: Definitely not how you start out a rock band - going like, you know what? Let's teach. NADWORNY: That's Damian Kulash, the lead singer of OK Go. He and the other band members have been hearing from teacher fans and the students who watched those videos in their classes for years. JENNIE MAGIERA: A treadmill is a really actually great way to teach rate. NADWORNY: That's Jennie Magiera. She taught in Chicago public schools for 10 years. MAGIERA: If you're at, you know, a 3.5 speed, that's a rate. If you're at 6.2 speed, that's a rate. So how many miles per hour is that? How fast are you going? How much harder is your heart beating? NADWORNY: She says these videos are great for teaching math and science. There's physics, algebra, calculus, lessons on quadratic equations, coordinate planes, gravity. JANET MOORE: It kind of nullifies the question of, when am I ever going to need to use this? OK GO: (Singing) When the morning comes. NADWORNY: The "This Too Shall Pass" video. It's an incredible four-minute Rube Goldberg machine. Dominoes trigger a marble. A rolling tire turns on a bunch of lamps. A guitar with spoons chimes water glasses perfectly timed to the instrumental break. A piano falls from the ceiling. A TV gets smashed. Eventually, the band members are sprayed with paint. For students, there's a huge question. How did they do that? MOORE: It sparks inquiry. It sparks curiosity. NADWORNY: And, Moore says, it's also a great intro to energy concepts. MOORE: When you understand math and science concepts, you can see the world around you differently. KULASH: Given that teachers are taking this thing that we've made and running into a whole new really exciting place with it, is there some way that we can like make that journey easier for them? NADWORNY: Lead singer Damian Kulash says to answer that question, OK Go partnered with the Playful Learning Lab at the University of St. Thomas. They surveyed more than 600 teachers. And educators told them they wanted three main things - classroom materials, challenges and assignments and access to the band. TIM NORDWIND: Hey, everyone, I'm Tim. KULASH: And I'm Damian. We are in the band OK Go. Back there, of course - Andy and Dan. NADWORNY: So the band made more behind-the-scenes videos. KULASH: Why don't we teach you some about the concepts that are in the video? And maybe you can use them to build some things yourself. NADWORNY: Explanation of concepts - what exactly is a parabola? - challenges for students to try, like using a compass on your phone to make music. KULASH: Science, light and sound. Science, light and sound. NADWORNY: And lots of questions and answers - and it's all free. KULASH: The universal we're trying to get at in so many of our videos is just curiosity and wonder and that sort of - that excitement about the world where like you want to uncover something magical. NADWORNY: Goulash says if classroom teachers, the real experts who instill and nurture creativity, want more tools, how could the band say no? Elissa Nadworny, NPR News. OK GO: (Singing) Upside down and inside out, and you can feel it. Upside down and inside out, and you can feel it, feel it. Transcript provided by NPR, Copyright NPR.